At WAGS HAPPY DOGS, we want you to have a clean, stylish pet at all times! We KNOW our dog parents are very particular about their dogs haircuts. At WAGS HAPPY DOGS our groomers are trained and certified and will listen carefully to your requests. From a simple puppy/kennel cut to a show cut, and everything in between, we got you covered. Also known as the Kennel cut, this is one of the most commonly requested hair cuts for dogs of all ages. It is especially popular for breeds with long or curly hair. 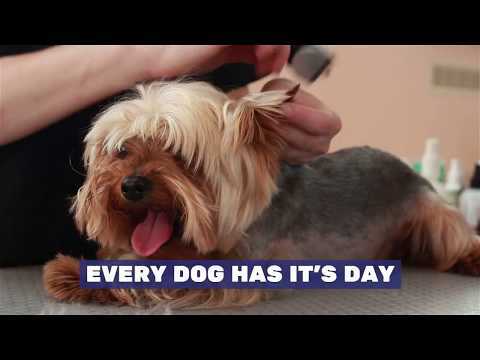 With this cut, we generally groom of all of a dog’s hair to one uniform length around the entire body of the dog, a cut that is especially good for owners who do not have the time or patience to brush through long, curly tangles. It is an especially good cut for these dogs to have during the North Carolina summer, as it generally allows them to remain cool in the summertime heat. You’ll want to brush your curly or long-haired dog out at home weekly at least to avoid matted hair which is difficult and costly to remove. Or bring your dog in to WAGS HAPPY DOGS for our brush only service or bath with brush-out to keep that coat clean and comfortable. Re-cut frequency every 6 to 8 weeks. One of the most recognizable of all small dog haircuts is the teddy bear cut. To achieve the teddy bear look, WAGS HAPPY DOGS groomers will trim the hair around your dog’s head and face evenly and slightly longer than what’s on the body. The hair on your dog’s body is trimmed much shorter with a puppy cut trim or variation, making this a great cut for warm weather. Come back every 4-6 Weeks as needed to keep that teddy bear face! For small dogs, typically under 20 lbs., this style is designed to make your small dog look like a little lamb. Both the head and the body are trimmed short, making this a low-maintenance look that only requires a trip back to the groomer every six to eight weeks. This short-haired look is perfect for warm weather, because it will help keep your dog cool. Popular among long-haired dogs of all sizes, especially chow chows and pomeranian’s. This cut is defined by a short cut on the body, with long hair around the head and jaw to create the look of a mane. The tail is trimmed short until the end, where a small tuft of hair is left like that of a lion’s. The Lion Cut makes your small pooches look like little lions. Often more of a hairstyle and trim rather than describing a haircut. It is common in Poodle’s but also used for other dog breeds like Maltese. For Poodles, it’s shaping that knot on the top carefully and show-like. For other breeds, it’s often used with a ribbon to hold the knot in place, accentuating the hair style atop your doggy’s head. Weekly or bi-weekly visits will keep that top knot in shape.